Lake Town, Kolkata, India- 700089. I have more than 5 years experiences in XI, XII and entrance exam coaching in the subject Chemistry. I have the highest degree in Chemistry (PhD). I give stress on proper understanding of the subject followed by problem solving to make my student confident for exam. Fees per months (4/5 classes) 2500-4000/- (depending on the requirements). Dr. Srijeeta Talukder describes herself as Chemistry Tutor. She conducts classes in Class 11 Tuition, Class 12 Tuition and Engineering Entrance Coaching. Dr. Srijeeta is located in Lake Town, Kolkata. Dr. Srijeeta takes at students Home. She has 10 years of teaching experience . 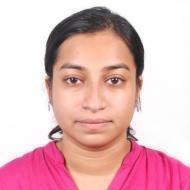 Dr. Srijeeta has completed Master of Science (M.Sc.) from Presidency College (University of Calcutta) in 2010 and Doctor of Philosophy (Ph.D.) from University of Calcutta in 2016. She is well versed in Bengali, Hindi and English.